Surely, however, this is the angriest and most bitter of Smith’s works to date, with its attack on the dehumanising apparatus of Britain’s immigration service: the UK Immigration Removal Centres, in which detainees are reduced to ‘deets’ – stripped of all rights and dignity. And, importantly, Spring is also an exercise in how that process transforms the people who work in such places into machines. And how, in fact, we are all in some way contaminated by that system; by the fact that we live in a society which allows it to happen and engage with media that condone it. Smith, Ali. Spring (Seasonal Quartet) (p. 223). Penguin Books Ltd. Kindle Edition. Painful to read, these are moments which prove just how normalised such discourse has become. Smith picks apart facile claims to freedom of speech. Language is no longer a system of communication, but a signifier of difference. And while the language of division comes cheaply, our failure to engage in genuine dialogue costs us dearly. For some reason just hearing it made her angry. It made her near tears. It felt like being bullied did, back when she was at school and had to pretend she wasn’t clever. Then Torq made it worse by smiling at her like he really liked her while he made the impossible sounding sounds. Her throat started to hurt like it does when you try to stop yourself crying. It was the language that was making it hurt. Smith, Ali. Spring (Seasonal Quartet) (p. 326). Penguin Books Ltd. Kindle Edition. Spring also picks up on Smith’s preoccupation with the act of storytelling. “All my work is about books,” she tells Christina Patterson in an interview for The Independent. “It’s all circular and it all comes back to books and what they do.” www.independent.co.uk/arts-entertainment/books/features/ali-smith-the-power-and-the-story-226080. Thus Spring zings along with the intertextual mastery so characteristic of her other work, intertwining its own stories with those of other narratives – such as the (almost) encounter between Katherine Mansfield and Rainer Maria Rilke in 1921, or tales of Scottish history. All of this reinforces the sense that it is narratives which make and break us. But that stories also feed in and off each other – and that in this respect, it is impossible to ever truly end a story. Continually surpassing their boundaries, stories spill into our lives and offer points of resistance and change. And that, at the end of the book, is what perhaps Spring offers by way of hope. While Spring can be read by itself, I would recommend reading it alongside Autumn https://wordpress.com/post/katecudahy.wordpress.com/1358 and Winter https://wordpress.com/post/katecudahy.wordpress.com/1292 as this reveals the way in which Smith is pulling a yet larger narrative together in startling and beautiful ways as she works through the seasons. It is also a novel which requires a second reading in order to allow all the hidden quirks and twists to fall into place. Yet another masterpiece which reinforces Ali Smith’s status as perhaps the greatest writer of her generation. In America, Jean Baudrillard maps out the Bonaventure hotel in Los Angeles as one of the ultimate sites of postmodernity. The building, he claims, is a “box of spatio-temporal tricks” (1988: 59). Decentralised and detached from the world outside, it creates and orders its own utopic reality; its guests and visitors seemingly stranded in a dislocated, sanitised hyper-reality. Yet, despite every attempt to erase the personal or the temporal, bits somehow get left behind. There are the physical reminders – “…the Left Behind Room; this is where all the things guests leave behind are stored…alarm clocks; batteries; books…” (105) or the dust “made of human skin,” (191). And there are the grieving friends and relatives left behind in the wake of a death. And no amount of regulation – no artificial measure of control – can, it seems, prevent the random accidents and encounters which live on in people’s minds and memories, in spite of the transience of hotel life. 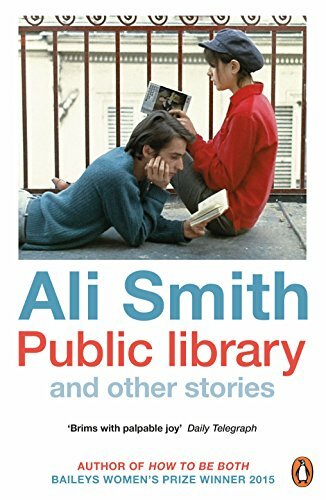 There are few writers, I believe, who quite succeed in occupying the minds of their characters to the extent that Ali Smith does. She renders them instantly recognisable, their traumas, dilemmas and joys our own. And they also offer a point of resistance to the apparent pessimism of Hotel World and its inhuman territory of pressed, starched sheets; numbered doors and static. They break down barriers, and refuse to submit to the sterility and quiet tyranny of postmodern existence. This is another book which proves that Smith is one of the most outstanding authors of her generation. So here’s confession of the day – I had never read Pride and Prejudice until about a month ago. I think I picked it up at the age of ten, decided it was probably beyond me and never returned to it. As I got older, I also harboured the sense that Austen just wasn’t for me, with her formalities and her social hierarchies and her neat, well-maintained romantic arrangements. I’ve always been more into the freak show masochism of Wuthering Heights, or the quiet probing of inequalities that is Middlemarch. And even though it’s really not possible to fault Pride and Prejudice for its well-tempered romanticism, there’s something that irks about Austen’s refusal to question or interrogate her subject matter. Why, I want to ask her, is Lydia so incapable of self-restraint? Doesn’t Lizzy’s marriage to Darcy reinforce rather than critique the prevailing materialism of the time? And it’s no use telling me that she was just reflecting the attitudes of her age. Clearly, she was astute enough to recognise the infantile behaviour of some women; to hold Lizzy up as a paragon of just what a good girl should really be like. But if she could see all of that, why didn’t she – as Mary Wollstonecraft had done some 21 years previously – suggest that there might be something lacking in women’s education? Or that there was something deeply unjust about depriving women of a means of supporting themselves if – heaven forbid – they found themselves without a single man in possession of a good fortune? There’s so much to love here – I don’t deny it. The zinging wit and repartee – the observational humour and awareness of human failure and foibles. But there’s also so much I have trouble digesting. And I don’t just put that down to twenty-first century sensibilities. I want my great writers to ask questions; not to reinforce the status quo. So my work in progress is Part Two of The Artist Enchanters Series – The Fresco and the Fountain. This book picks up the story a few months after the devastation and destruction wreaked at the end of The Firefarer, and is told from the perspectives of the three main characters as well as arch villain Lino Ampelio Ol Terenzo. I’m hoping that The Fresco and the Fountain will be ready for release by April this year. Below is part of a sample chapter from the new book, in which Vito is trying to put the past behind him and learn something of Pagi arts. “You will observe how the artist draws our attention to the hunters’ chase.” Avala Ol Hauriro circled the central motif of the painting with a jewelled finger. The artwork was small in scale, framed in dark, resinous walnut and balanced on an easel in the centre of his study. To its fore, a tight knot of Pagi hunters pursued a wounded hart through dense woodland. The forest itself resembled an exercise in geometry rather than a depiction of nature, its trees a sprouting series of matchsticks. He shifted his gaze from hunters to trees as instructed: at the mustard brown of their bark and the emerald shreds of their leaves. At the quaint parakeets and owls which nestled in their branches. The lightest breath of wind brushed his cheek, like a woman’s kiss. Vito shivered. This was unwise; he should tear himself from the painting now. He was too old to learn of Pagi art without falling into its net. It would ensnare him: a poor, lapsed monk who knew nothing of its dangers. But without this knowledge, he would never hope to prove a match for his brother. And so he forced himself to look. The forest parted. Boughs bent to his sight, the wind sifting the leaves. The hart bounded past, having evaded the Pagi. And there, lying amid a grove of fir trees lay a naked man and woman, their clothes strewn across the grass. They clung to each other, rising together in their love making. And then the woman raised her head and looked directly at Vito, her grey eyes meeting his over her lover’s shoulder. Her hair was a wild shock of brown curls. “So you saw us.” She played idly with a ring of sapphire set upon her right index finger. “Does he know?” Vito gasped, breathless. “Wait here.” He held up a hand and dashed from the study, tearing down corridor after winding corridor until he’d reached his own chamber. Breathless, he crouched beside the bed and dragged a battered old satchel out from under it. The leather of the bag was faded, scratched and in places pocked with scorch marks. Vito slung it across his shoulder and raced back to the study where Avala stood with her back to him, gazing out of the window. He felt inside the satchel for the book, tracing his fingers over its torn cover; over the title engraved across its spine. Then, without further hesitation he tipped it out onto the desk, embarrassed when two tawny plaits of hair fell out beside it. Hastily, he brushed them back into the bag and opened the book, flicking through its pages, trying to ignore the stories it had weaved all that hot summer as he had wandered grief-ridden along the parched paths of the Pagi and into an arena of mass slaughter. The words were still there, written by an unknown hand, scrawled across the base of the final page. Death is but a locked door. And I am the key. And now he was certain that Avala, with all her knowledge of Pagi ways, with her insights into magic and art, would help him to unlock that door. A strange coldness pricked the hairs on the back of his neck. She was behind him, he realised: peering over his shoulder at the book. He sensed her fear. “Where did you get that?” she whispered. “Is it true, Avala?” He turned to her. Her lips had thinned to pale lines; her eyes worked with fear. “Burn that book, Vito. For all our sakes. Don’t let it tempt you. Don’t read it, don’t look at it. I’m…I must go. I can’t stay here.” She was gathering up the painting, wrapping it in a swathe of linen. She didn’t look back. She was gone, out the door, her footsteps echoing to light clips as she fled from the palace. He sank down in his chair, brooding on the book. It was all he had…that, the seal and the hair. Avala didn’t understand; how could she? She hadn’t seen the things he’d seen, and for all her knowledge of art, she wouldn’t ever come close to the powers, the forces which had laid waste to entire armies, which had wrought such suffering, pain and death. Avala, he decided, was a novice. And so, for that matter, was his brother. If he unlocked the door of death itself, if he could right the wrongs of the past, then he would be greater than all of them. And Andre would come back, fleet of foot, tearing through the fabric of time with brightness and grace. Immortal. Recently I ordered a couple of ‘real feel’ copies of works by or about Ali Smith – Girl Meets Boy, and a collection of critical essays on her work. I already had one of these books on my Kindle, but as I needed volumes with page numbers, I decided to order from second hand bookshops. When both books arrived, they were coated in library issue plastic covers, and one of them still contained stamps from Dulwich public library. Coincidentally, I was just reading Smith’s volume of short stories Public Library, which addresses the demise of this treasured institution across the UK following a decade of local government cuts and austerity. It was both ironic and deeply saddening, and it made me think of what a focal point the library was in the small Derbyshire town where I grew up. (I’m happy to say that’s one book palace which survived the chop). A visit to the library meant opening up new worlds: a very private new world as a reader in a very public space. And it meant measuring one’s progress from childhood to adolescence when you received the adult reader card – a rite of passage noted by a few of the contributors to Smith’s volume. Libraries are communal spaces and democratic spaces. They function like an enormous secret we’ve all been let in on. Downloading an ebook is just not the same – you don’t have that same sense of sanctuary, or of paying books their due respect while celebrating the fact that this is one of the few times life genuinely gives you something for free. Because without an internet connection and a credit card, you’re mostly forced to source your books the pirate way. And that demeans all of us – authors and readers. The short stories in Public Library are also a celebration of the act of reading itself, of words and their power, of writers and their histories. Smith has the most amazing ability to mine for joy and subversion in all of her work; to eke out a space in what we take for granted, enabling the reader to see it from new perspectives. I can think of no other author who could effectively pair a tale on credit card fraud with an investigation into the death of D H Lawrence. Or who could trace the breakdown of a marriage to an obsession with Katherine Mansfield. Smith is best at making the incongruous seem a vital part of lived experience – at tracing analogies and associations between the most disparate of pairings. She’s a rebel writer whose work casts an even light over popular culture as much as the literary past, if it will draw her reader’s attention to an idea or image. And snaring our attention is something she never fails at. Public Library is a paean to our most treasured communal spaces, and to how books connect us across geographies and across time. An essential read and a provocative one. Neo-gothicism seems to be the order of the day in contemporary British literature, with writers like Sarah Perry, Sarah Waters and Andrew Michael Hurley all offering new takes on a much out-moded genre. What all these authors have proved is that the gothic – with its hauntings and secrets, its dark retreats and the way it plays on our most hidden fears – offers perfect territory for exploration of all that we would still repress, even in our current age of confession, self-expression and over-sharing. What Perry achieves in Melmoth is nothing short of astounding, and I have to admit that as much as I enjoyed her previous outing The Essex Serpent, Melmoth proved a more satisfying read, abounding in cunning devices which deceive and challenge the reader. To such an extent, in fact, that Perry claims one American newspaper was entirely taken in with the myth of Melmoth when in fact it was her own invention! Taking her cue from Charles Maturin’s 1820 novel Melmoth the Wanderer, Perry transforms Melmoth into a biblical figure – one of the women who witnessed the resurrection of Christ, but refused to acknowledge it. As a result, she is forced to walk the earth until the day of judgement, watching the guilty and, in her loneliness, summoning sinners to walk with her. Though set in 21st century Prague, Melmoth has a timeless feel which Perry creates through artful use of dialogue and description so that, in her own words, she renders the present ‘strange’ (podcast: The Guardian) or uncanny, thereby creating the perfect gothic backdrop to the horrifying story which unfolds. And what emerges is a story which terrifies far more through its exploration of human cruelty than its supernatural references. The narrative pivots around the shy, shrinking figure of Helen Franklin: an English translator enduring self-imposed exile for a crime committed long ago. Because Helen refuses to confront her past, the reader is denied knowledge of what that crime might have been until the very end of the novel. In stead, Helen sets about uncovering the myth of Melmoth through stories left behind by the Wanderer’s victims, each of which reveals an aspect of human cruelty and weakness. And by the time Helen is ready to examine her own conscience, we are left in no doubt that her sin was truly grave. What I really loved about this book was its structure: the stories slotting inside one another like the matryoshka dolls sold to tourists on the Charles Bridge, with Helen’s own personal narrative both framing and nesting inside each one. Perry’s skill as a writer means that the novel glides over a range of genres and styles, from biography to travel diary, with subtle intertextual references ranging from Maturin to Kafka. And the story pays out its surprises with such perfect pacing that its finale leaves you breathless – and in no doubt that while the author has dredged humanity’s dark side, it’s the light which remains. This is literary sleight of hand at its most dexterous – an absolute masterpiece. So the first thing to say is that no one does bleakness like Andrew Michael Hurley. And there’s something attractive – and underrated – about bleakness. He did it so well in The Loney (review here) that you could almost feel yourself sinking into the sludge and fog of the Lancastrian coastline. And this time, in Devil’s Day, he creates the impression of a farming community so lost, isolated and ill at ease with itself that you really start to believe the devil might be haunting the moors and forests of the Ribble Valley – and exacting his price from the humans he preys on. Born into the Endlands – said claustrophobic little farming community – John Pentecost has left to become a teacher in staid, sober Suffolk. He heads north, however, with his wife Kat and an agenda. John wants to return to the Endlands, and he wants Kat there with him. But the valley can’t hold back its secrets for long, and what at first appear to be quaint traditions and beliefs may reflect a darker truth – a truth which Kat refuses to accept. Hurley excels at drip feed horror – at a gradual revelation of phenomena and events which may or may not be connected, and which may or may not have supernatural origins. And that is where the real complexity of his stories lie – in their ambiguity. Just as in The Loney, it’s hard to say with Devil’s Day where human work ends and the devil’s might begin. And evil itself might as easily be found in nature as it is in any external force for ill will. It’s possible that Hurley might have overstretched the pacing somewhat with this one. The Loney paid out its surprises more evenly – with Devil’s Day, a good 50% of the novel is devoted to detailing The Endlands, its history and inhabitants. But then again, this contributes to a sense of a world that is lived in, that is real, and that could very well have settled into practices that set it beyond boundaries and belief systems. Devil’s Day is a story that chills to the core. Perfect Halloween reading. This is probably the angriest book I’ve read all year. The Mars Room is not just an indictment of the American prison system, but an exploration of how society itself fails many of those who get caught up in that system. Romy Hall, a dancer at the infamous stripper joint ‘The Mars Room’ ends up in a high security Californian ‘Correctional Institution,’ having murdered the man who stalked her. At the same time she discovers that her mother – sole guardian of Romy’s little boy Jackson – has died, and that her own parental rights have been revoked. With no say in the matter, Romy is left estranged from her own child; unable to trace him from prison. Part furious satire, part invective, Kushner’s novel exposes the farce of a system which leaves the most vulnerable in a position where they will almost inevitably end up behind bars. It is a system characterised by institutional violence. People like Romy – or her cell mate Button Sanchez – are victims of the conditions it creates; punished hypocritically by a society which refuses to examine the way it fails so many of its own citizens. The Mars Room prises apart the myth of a judicial system aimed at rehabilitating prisoners. Such people are thrown into a cycle of violence and counter-violence from birth; the scapegoats of a society which refuses to examine itself and its own crimes. A hard read, but an essential one.